An impressive performer for action and shooter games, where its very much at home. Not an all-rounder but a really good value-for-money set of cans. Turtle Beach are one of the biggest players in the headset market, known as makers of quality cans. So, the Recon 200 will be under plenty of scrutiny. It pitches itself as an affordable, entry-level headset, that offers quality sound for gaming. It’s a neat headset that’s wired into your controller with an audio jack cable making it perfect for console gamers and Switch players too. Let’s see how it stacks up in a crowded marketplace. There’s plenty to like about the headset in an aesthetic capacity. I tested the white version and it has a very pleasing and stylish design. 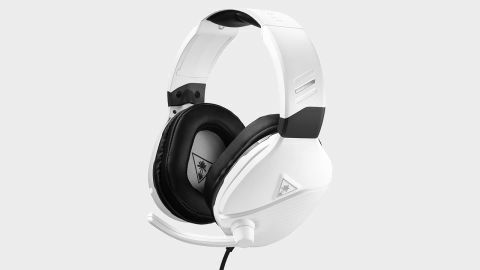 Coming from Turtle Beach, the headset comes from good pedigree so it looks sharp and is definitely an attractive bit of kit. This is also clear in the build quality - even though it's at the more affordable end of the spectrum, it doesn't seem to have compromised on how sturdy it feels. It’s different from the likes of the Elite Pro 2 and the Elite Atlas for sure, but retains a lightweight feel and doesn’t come across flimsy. Elsewhere, the first impressions of the faux leather earcups were not brilliant: they’re OK but feel a bit tacky. And the limited cushioning on the top of the headband looked a bit mean in terms of coverage. Overall though, it very much looks like a Turtle Beach headset and there’s enough in its design to give you (at least in the first instance) confidence in its build quality. To read how I tested the Recon 200, and how we all do it here at GamesRadar+, see how we test headsets here. First up, what's in the box: the headset itself, with its attached audio jack cable; a small setup guide pamphlet; and a short USB charging cable. All standard and ready to go straight away. The mic stands out straight away (not quite literally) as it's a permanent attachment to the headset. It fits right in with the design and is nicely scaled so feels at home on the headset. When it's flipped up (and goes on mute), it almost camouflages into the design too. The on-headset controls are clear and not convoluted, or made baffling by weird symbols. A power switch is clearly labelled with an off setting and PS4 and Xbox selections, plug the audio jack into your controller and off you go (you use the Xbox setting when using the headset with PC, Switch or a mobile device). The two dials adjacent to this switch relate directly to microphone volume and master volume. Nice and simple and reduces and reduces the potential for any confusion in setup. It’s worth noting that older Xbox controllers will need an adapter to complete the connection, but the Recon 200 is also compatible with Windows Sonic - Microsoft’s spatial and surround sound support for Windows and Xbox One. However, for those wanting to use that on their PC, be aware that the Recon 200’s audio cable ideally could, or should, be a bit longer. It’s not a wireless headset, but still requires recharging, so simply plugging into a controller isn’t enough to feed the audio. The always-on bass boost mode caught my attention as anything with the words ‘always’ and ‘on’ can raise an eyebrow: removing personal choice can seem like a strange approach. However, pleasingly, it never really overpowers. This bass boosted sound is pumped into your ears by some solid 40mm speakers that are standard for a headset at this price. So, let’s cut to the chase: the overall sound quality is broadly very good. I don’t have any major complaints and no major holes were left in my audio experience. But, at the same, it was never spectacular. It never brought something previously unheard to my attention, rocked my socks off or blew me away. I will say though, that the always-on bass boost is decent, and became very noticeable when shifting to a different headset - I ended up missing it - so this quality tidbit helps to mitigate the good-but-not-spectacular overall sound. The microphone showed its quality from the off, picking up the sounds of my dishwasher from a room away. At first hearing this and my own voice very loudly was off putting, the idea of this is to measure how loud your voice is, but I’ve always found that the best measure of that is to just ask your friends if, and how well, they can hear you. The flip to mute function works perfectly and gets it out of the way, but the mic isn’t detachable or retractable; it remains a permanent fixture. Its battery life of around 12 hours is pretty good for a gaming headset - particularly in this price range - so you’ll be well covered with that. Turning to its main purpose in life, I tried a few games out with the Recon 200 to give it a good test. My current game at the moment is Divinity Original Sin 2 and I immediately noticed that the Recon 200 was excellent at conveying the dialogue and medieval-esque music to me - both were lovely and clear. Elsewhere it was a little thin, with any lower tones - not just bass, per se - less prevalent, leaving me wanting a bit more. This was massively rectified when I turned to Doom. The Recon 200 really came to life with the fast paced action, weapon sound effects and booming soundtrack, catching all the low-to-mid range sounds very well. Combined with the surround sound, this is where I had the best experience with the Recon 200. The surround sound was then primarily responsible for my second best experience with the headset by aiding me pretty well in The Division. I could hear my teammate clearly even in the loudest and busiest encounters, and I knew where the threats were coming from. After a while on these testing sessions, however, the headset did become a bit uncomfortable, particularly around the top of the ears and the top of the head where the limited cushioning became noticeable. And the faux leather cups caused my head to become a bit clammy which added to the discomfort. Away from games, to complete a rounded test, the Recon 200 performed with movies and music pretty much as I expected: A-OK. The dialogue was nice and clear for the most part and everything sounded pretty good, but lacked that cutting edge or really memorable quality for movies, TV and music. Because its meant to be wired in to your controller or PC, it identifies itself as probably not the headset you’ll watch TV or listen to music with, plus, with the headset becoming a bit uncomfortable after long sessions, it's difficult to recommend them for movies or Netflix binges from a comfort point of view, too. The Recon 200 is a good value headset from a trusted manufacturer. Games are what it’s designed for and it’s not afraid to show it, and my experiences with action games, and primarily shooters, was excellent. The always on bass boost enhances action noises and helped to give me my most rounded experiences while playing games like Doom and The Division. Elsewhere, it’s competent for movies and music, and using for Skype etc too, but with those tasks not being its true calling, it’d be hard to recommend it as a true all rounder. If you’re a fan of Turtle beach products already, or are looking to surprise someone who is - with gaming almost purely in mind - then these are easily recommendable and you could do a whole lot worse for $60/£50. But it’s also worth noting that you could do a bit better if you’re able to stretch your budget just a little further: one of our favourites, the Razer Kraken Pro V2 - which sits atop our best PS4 headset list, or Sony’s official Gold headset (for PS4 players) are both not much more expensive (both about $80/£70) and as well as doing gaming exceptionally well as their primary purpose in life, are very capable with almost every other task, too. That’s not to totally dismiss the Recon 200 however, which is a fine gaming headset, that has a memorable bass boost, and that really flexes its muscles in action and shooter games.